This 100%, pure sheep’s milk feta is made on the only organic farm in Bulgaria, located in a small town just north of the Bulgarian capital, Sophia. 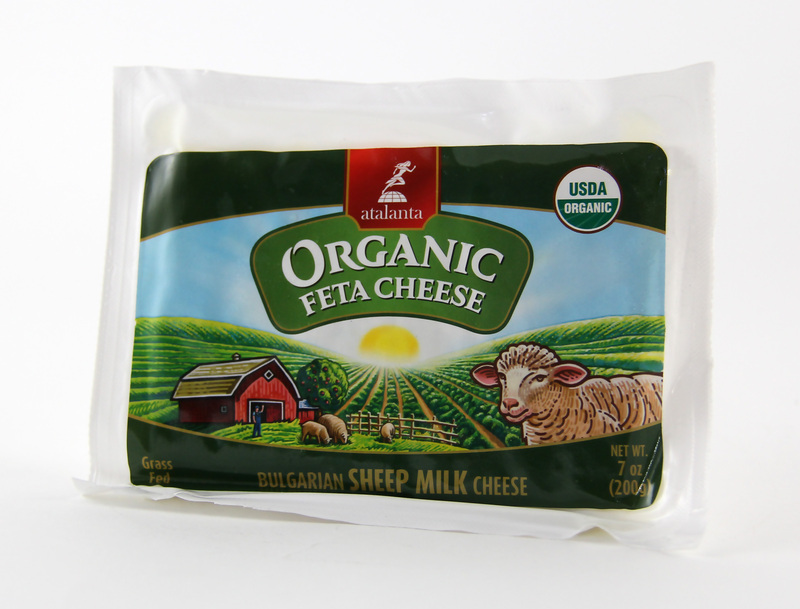 Grass-fed sheep produce the rich and wholesome, high quality milk that goes into Atalanta’s Organic Bulgarian Feta, which is carefully crafted according to time honored techniques. Feta, derived from “fetta,” meaning slice in Italian, was so named since the cheese is created in large blocks before being sliced for brining. The brine used for Atalanta’s Bulgarian Organic Sheep’s Milk Feta is also organic and gives this creamy but slightly crumbly textured cheese a pleasantly salty taste. Application: Also known as “salad cheese” for its most common use, this feta is perfect for enhancing salads but is also ideal for crumbling into dips, over pasta dishes and pizzas. Organic Bulgarian Feta is delicious in any recipe that calls for feta, like roasted vegetable and baked chicken dishes, Mediterranean inspired omelets, quesadillas, and of course traditional specialties like Spanakopita. Fry this organic feta on its own, or enjoy as a table cheese, drizzled with extra virgin olive oil and paired with grapes and olives. Pairing: Try it with an Italian Pinot Grigio or a light red wine like Beaujolais. Toschi created Balmi Glaze with Balsamic Vinegar of Modena to deepen the experience of any dish, from starters to desserts, with exceptional, complex flavor. Balmi Glaze is a new, unique sauce that combines convenience and innovation, while retaining the traditional and unmistakable taste of Modena’s famous Balsamic Vinegar. Toschi Balmi Glaze is an exciting alternative to condiments like mayonnaise and ketchup and goes well beyond usual uses. Just a small amount of this thick, robust, tangy, sweet, savory glaze gives an extraordinary extra dimension to grilled meat, roasts, hamburgers, ham, fish (prepared any way), chicken, French fries, raw or cooked vegetables, fruit, vanilla ice cream, panna cotta and of course cheese.